The ASCWeb is headquartered in Hattiesburg, Mississippi, within the School of Construction at The University of Southern Mississippi. The Associated Schools of Construction’s corporate office is located in Windsor, Colorado. The ASC is the international association representing the interests of both academic and industry professionals interested in institutional construction education. The ASCWeb site is an information resource which collects, analyzes, evaluates, packages and disseminates information to facilitate accurate communication and decision-making within academic, industry and government settings. The membership of the ASC, like the field of construction management, is richly interdisciplinary, drawing membership from such disciplines as architecture, engineering, management, technology, to name only a few. The Association offers a variety of programs and services designed to help its members serve their customers more effectively and succeed in an increasingly challenging environment of information management and technology. The Association is organized into seven regions in the United States (Northeast, Southeast, Great Lakes, North Central, South Central, Rocky Mountain, and Far West) and two international regions, one for international institutions (Canada; Europe; Asia and the Pacific; and Caribbean/Central/South America) and one for industry professionals. Regions within the U.S. hold individual conferences and combine in the fall for a large international ASC Annual Convention. 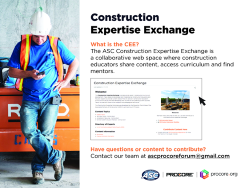 The ASC is dedicated to the professional growth and success of its membership, and is committed to fostering excellence in construction communication, scholarship, research, education, and practice.